When Katie Smith was growing up in Logan, Ohio there were no youth basketball leagues for girls. “I had to play on a boy’s fifth-grade team,” said Smith, 41, who went on to star at Ohio State and in the WNBA and win three Olympic gold medals with the U.S. Women’s basketball team. The times have changed and women of all ages are participating in sports in unprecedented numbers. 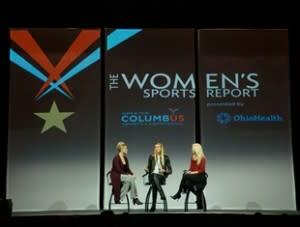 Nowhere is this more in evidence than here in Central Ohio, and all this success was on display Wednesday morning at The Women’s Sports Report of the Greater Columbus Sports Commission. Kerri Walsh Jennings, 37, was the keynote speaker at The Women’s Sports Report, which was appropriate. This is the Year of Volleyball here in Columbus, and Walsh Jennings and her former partner, Misty May-Treaner (now retired), have won the past three Olympic gold medals in Beach Volleyball – and inspired thousands of girls to start playing volleyball. Walsh Jennings and her newpartner, April Ross, are after Olympic gold in Rio de Janeiro this summer. They’re spreading it on thick in Central Ohio! The Ohio Valley Region is the second largest region of USA Volleyball, said the group’s Sandra Borer. The OVR has about 28,000 adult and youth players, with the majority in the girls’ youth category. “She makes it look so so easy and so much fun and interesting and those are the three things you need to get girls to play the sport,” Borer said. Smith’s three gold medals were on display at the event, and Walsh Jennings stayed after the program concluded to sign autographs. “This is such an amazing time to be a female athlete and to be a volleyball player,” Walsh Jennings told the crowd of about 700 gathered at the Greater Columbus Convention Center. She talked about the sheer number of women playing all sports, especially volleyball, and the off-the-charts excitement of the upcoming NCAA Div. I Women’s Volleyball Championship. BTW: They will be held Dec. 15 and 17 at Nationwide Arena here in Columbus. There are three other major volleyball events here this year: The Ohio Valley Region Kaepa Girls Volleyball Championships, May 7-22 at the convention center; the Junior Volleyball Association SummerFest, June 4-5 at the convention center; and the American Volleyball Coaches Association Annual Convention during the NCAA tournament in December. About 2,500 coaches will attend. This is also the start of an exciting three-year cycle of NCAA women’s basketball here in Columbus. Capital University will host the Div. III Semifinals on March 19; Ohio Dominican will host the Div. II Elite 8 and National Championship on March 21-24, 2017; and the NCAA Div. I Women’s Final Four will be held at Nationwide Arena in 2018. “We’ve very proud of that and I think we’re the only city to ever consecutively host Divisions I, II and III,” said Linda Logan, Executive Director of the Sports Commission. Volleyball and basketball are two of the many sports popular with women of all ages. At the Women’s Sports Report, six local athletes and five teams were honored in recognition of their Ohio High School Athletic Association championships in lacrosse, bowling, swimming, track and field, golf and field hockey. Walsh Jennings is recovering from shoulder surgery after suffering two dislocations during matches late in 2015. She played through the pain and adversity, calling it “fun.” She and her husband, Casey Jennings (also a volleyball player) have three children, Joseph, 6, Sundance, 5, and Scout, 2. “The journey has been amazing,” Walsh Jennings said, and then offered some advice for young athletes in all sports.